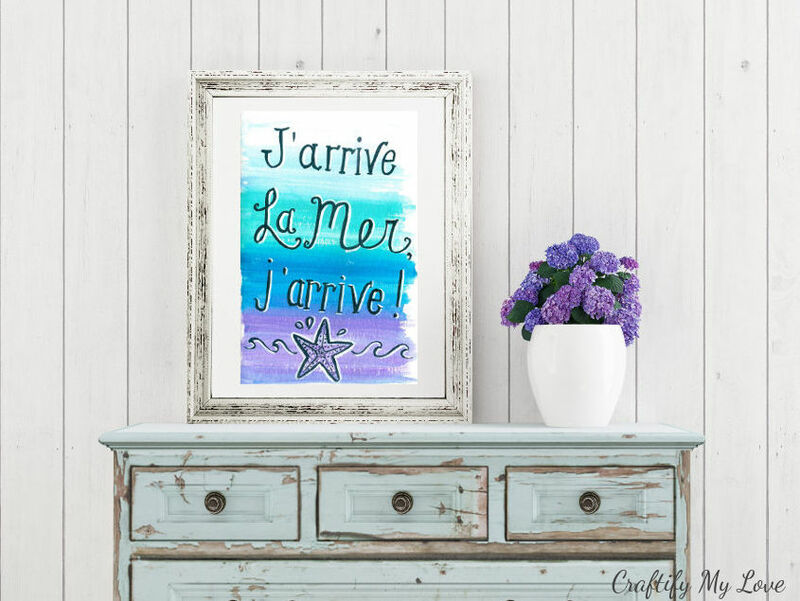 Free Summer Printable: J’arrive La Mer, J’arrive! Today I have a free summer printable for you. 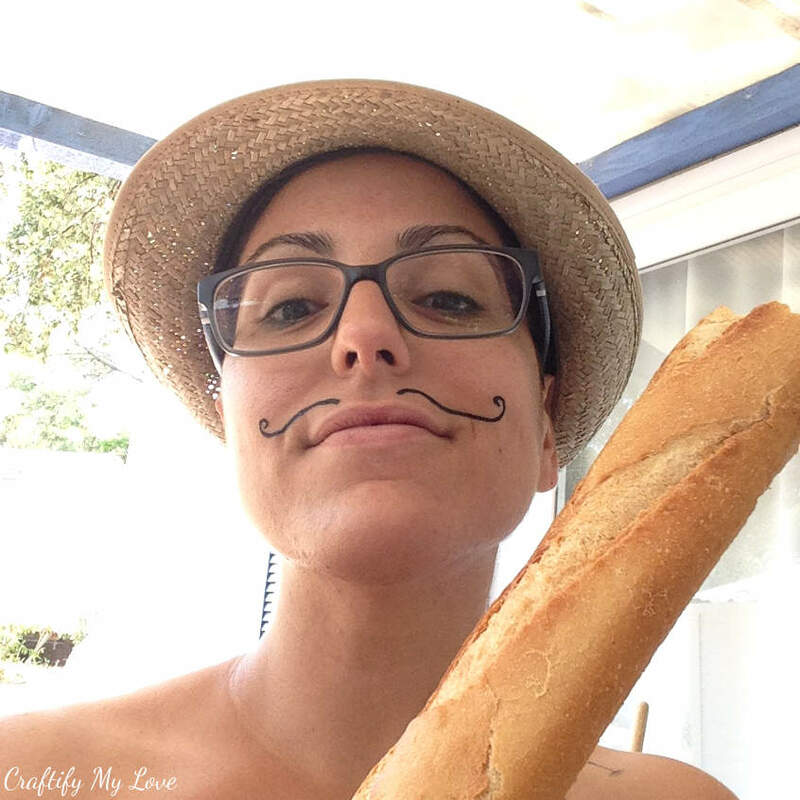 It was made in the South of France, right next to the azure and emerald colored beaches of Côte d’Azur. This hand-lettered watercolor will most definitely bring that beachy vibe into your home and inspire you to plan a beach vacation asap. 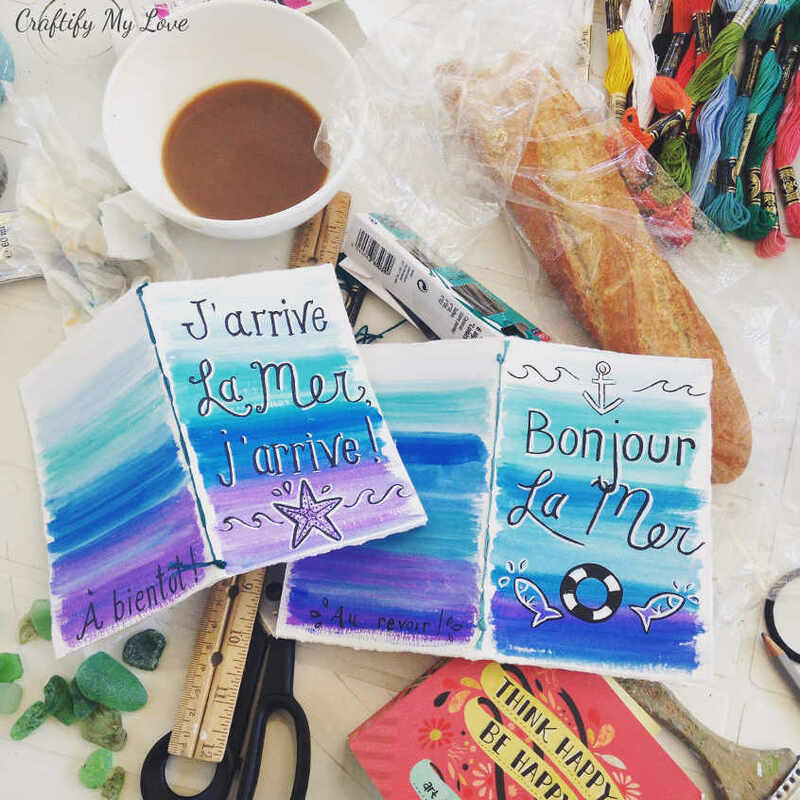 Keep on reading, and join me on a short trip to Cavalaire-sur-Mer, in the region Provence-Alpes-Côte d’Azur in France, where I’ve spent a fabulous little vacation with my best friend Yvonne in 2015. 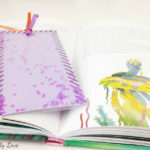 At the end of this post, you’ll even find directions on how to make a watercolor & hand-lettering mini notebook or photo album yourself. We searched the web and decided to rent a mobile home at Camping de la Baie. It’s a cute little campground smack in the middle of Cavalaire-sur-Mer. Here is the address if you want to do a google maps search: Boulevard Pasteur, 83240 Cavalaire-sur-Mer, France. We’ve made our reservations right on the campgrounds website Camping de la Baie and were quite happy with how easy that turned out to be. Luckily the site translates to English and German as our French was not the best. This post contains affiliate links. For more information, please see my disclosure here. On our way home, we took a detour and stayed two nights in an AirBnB in Florence. Right next to that gorgeous cathedral with everything within walking distance. Make sure to sign up through this link to AirBnB to receive a $30 / 25 Euro discount for your first booking! We wanted to do Venice, too but ran out of time. Oh well, there is a next time, right? 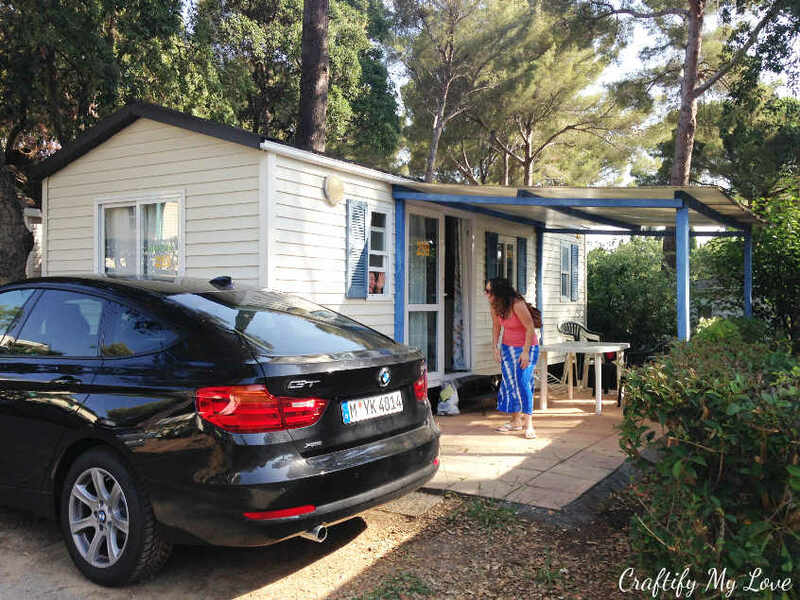 We decided to drive from Germany to the South of France and opted for a rental (back then we’ve checked rates of various companies and found Sixt had the best offer). Why? Because my car back then was super old and a stick shift. My friend Yvonne is American. So in order to be able to split up the driving, we had to get a rental with an automatic. 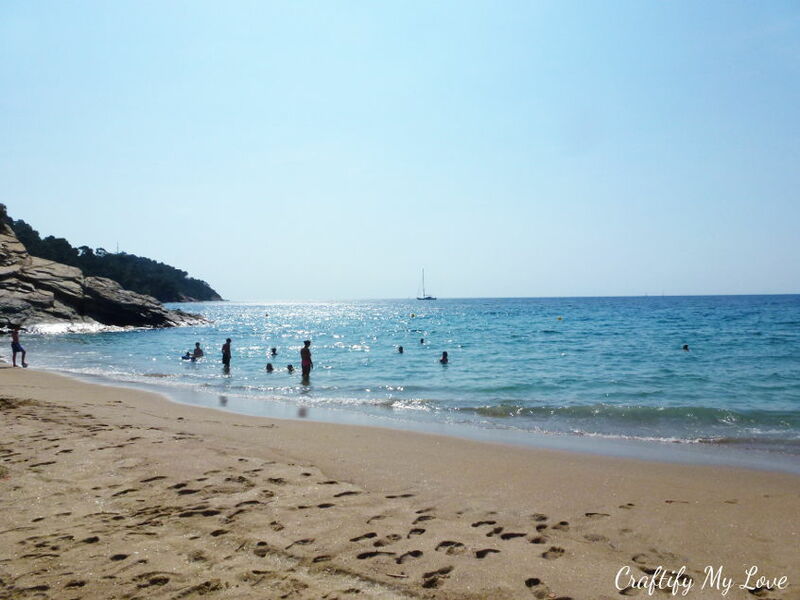 The trip to France took us around 11 hours and we arrived late at night in our rental, so we started exploring our campsite and Cavalaire-sur-Mer early on the next morning. Browse those cute little boutiques on Avenue des Alliés. Enjoy a café au lait in one of those little cafés. Wine and dine in one of the nice restaurants at the marina. Take a trip to Saint-Tropez. It’s only a 30-minute drive. The big yachts are quite impressive. 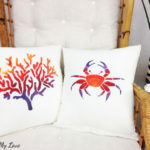 Or have a fun crafternoon on your porch or balcony of your vacation home. 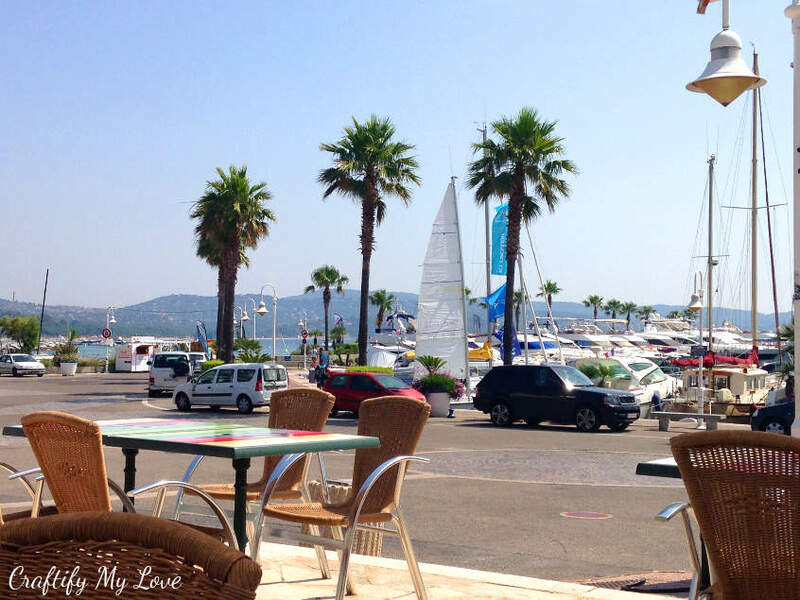 Cavalaire-sur-Mer has gorgeous little boutiques, cafés, and restaurants that serve the most delicious seafood. We’ve enjoyed some ice cream at the marina in the afternoon after we’ve browsed the shops on our first day. Drive by the supermarket Carrefour at Avenue des Alliés, 83240 Cavalaire. You could pick up some snacks for the beach there, too. If you keep driving you’ll find the little path to the beach Plage de Bonporteau shortly after the roundabout westbound out fo the city. Grab your craft supplies, some local food, and a cup of coffee and enjoy a little creative time in the shade. We’ve handcrafted these two little notebooks that we also thought could be perfectly used as a photo album for all those great vacation memories we’ve created together. This is my friend Yvonne. She is an artist and she creates the most wonderful things. I’ve met her in Germany although she’s from the US. I am so happy that she married my neighbor next door and that we became such good friends. Although they both moved back to the States almost two years ago, we still are best friends and try to see each other as often as possible. 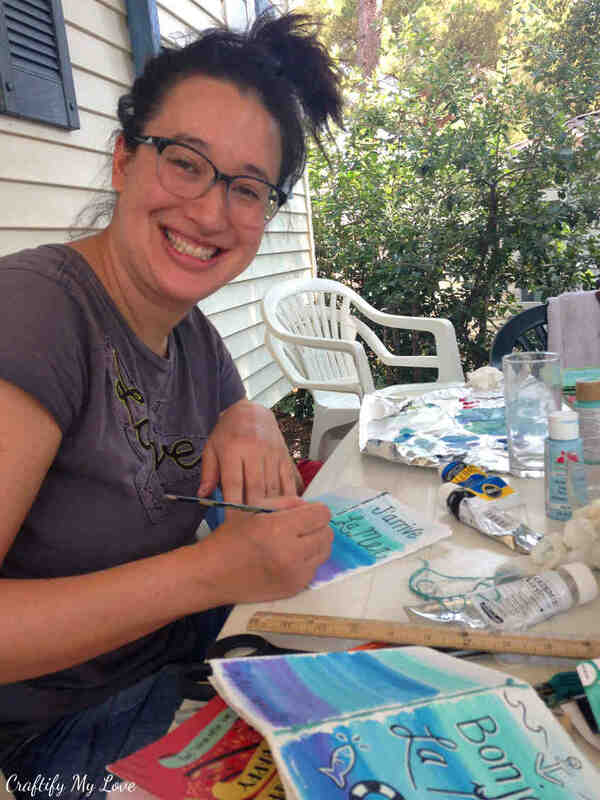 Yvonne brought her craft supplies and we enjoyed a lazy crafternoon together on our porch. We’ve handmade these little notebooks/photo albums from scratch, and so can you! Fold a piece of sturdy paper in half and crease it hard using your fingernail. Rip the piece of paper in half along the crease you’ve just made. It can help if you use the edge of a table to do so. Fold each of these two pieces of paper in half. One piece of paper equals 4 book pages. Repeat as often as you wish. I’d recommend at least 3 more times. Create the book by laying all of your previously folded pieces of paper on top of each other. 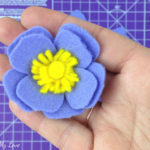 Using a needle and embroidery thread (they come in great colors! ), you’ll make the binding now. Simply stitch along the crease. This last step will be easier if you pre-punch the holes with your needle in each piece of paper. Make sure to get the spaces right, though. Once you’ve created your book, it’s time to decorate it. 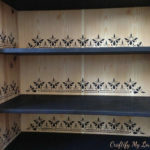 Grab some paint (we’ve used acrylic paint) and heavily water it down to your liking. Adding some water to the paper can help for smoother transitions. 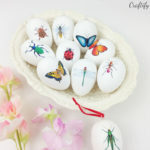 For more tips on how to watercolor, you could hop on over to Favecrafts. Start painting the background with a brush, using different shades of blue and turquoise. I’d reccomend starting with the darkest part. Using a pencil, you can lightly trace your design. With a super thin brush and solid black paint hand-letter your favorite beach words and symbols onto the cover and the back. After it’s dry, you can add highlights in white. Now, tell me: Where will you spend your summer vacation? 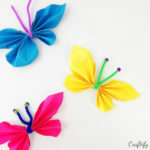 And will you bring your craft supplies and try your hand making this mini notebook for your precious holiday thoughts? 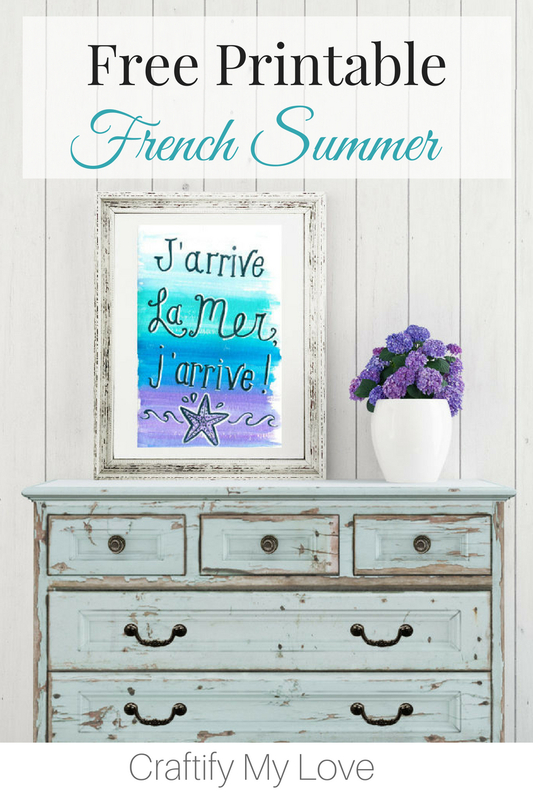 In the meantime, don’t forget to download your free summer printable J’arrive La Mer, J’arrive! to start celebrating that wonderful summer time. PS: Don’t forget to PIN this to Pinterest, if you want to download your free summer printable later or remember how to make your very own vacation photo album. What a fabulous vacation you had. And how wonderful to have a friend who gets what you do. That was a friendship met to be. I enjoyed taking this trip with you. Oh Debra, thank you so much for this lovely comment. I was not sure if people would enjoy reading about my travels, too. 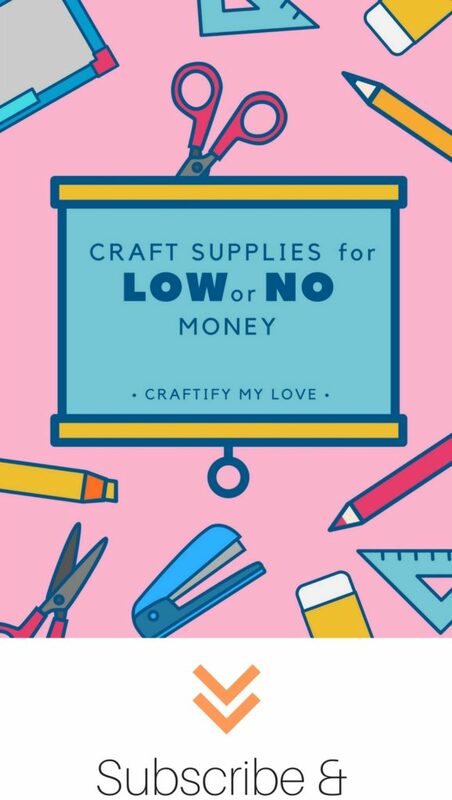 But next to crafting, traveling and eating are my main hobbies, lol. Yvonne is really a kindred spirit and we always have such a fun time together. Looks like a great place for a vacation. Mediterranean beaches rock (this obviously from someone living close – though the ones closer to our home are technically in the Atlantic…). It was a super great place for a vacation, Teresa. 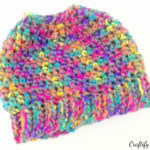 Thank you for stopping by at my blog. I really appreciate it.